Dr. Norman C. Francis and Xavier are virtually synonymous. As president of the nation’s only historically Black and Catholic university, Francis has guided Xavier’s growth both in size and dimension. During his tenure, the University has more than doubled its enrollment, broadened its curriculum, expanded its campus, and strengthened its financial base. Its tradition of academic excellence has been further enhanced. Francis, the longest-sitting university president in the U.S. (since 1968) and himself an alumnus, has been at Xavier for more than five decades as an administrator. He is credited with being the catalyst for nearly every building constructed on the campus during the past four decades. The campus itself has been physically enlarged with the acquisition of the adjacent properties to the East and West of the original main campus. Among the major accomplishments of Francis’ tenure has been the successful completion of several capital campaigns. Giving by alumni has also increased dramatically, while student enrollment has surpassed the 3,400 mark. All of this growth has not been at the expense of academia, however. Through his leadership, the University has instituted a core curriculum and mandatory comprehensives, and has become nationally recognized as a leader in minority education. According to the US Department of Education, Xavier continues to rank first nationally in the number of African American students earning undergraduate degrees in the biology and the life sciences, chemistry, physics and pharmacy. Xavier is one of only six schools chosen to participate in the National Science Foundation’s Model Institutions for Excellence in Science, Engineering and Mathematics program. Xavier has been especially successful in educating health professionals. In pre-medical education, Xavier is first in the nation in placing African American students into medical schools, where it has been ranked #1 since 1993. The College of Pharmacy, one of only two pharmacy schools in Louisiana, is among the nation’s top three producers of African American Doctor of Pharmacy degree recipients. Named by his peers as one of the 100 most effective college and university leaders, Francis is often cited for his involvement in the community and his work on the national, state and local level to improve education. Francis enjoys a prestigious national reputation, of which Xavier is a primary beneficiary. He has served in an advisory role to eight U.S. presidential administrations – not only on education issues, but civil rights as well – in addition to serving on 54 boards and commissions. In 2006 then-President George W. Bush presented him with the nation’s highest civil award, the Presidential Medal of Freedom. In 2009 he was named one of “America’s Best Leaders” by U.S. News Media Group and the Center for Public Leadership (CPL) at Harvard Kennedy’s School of Government. 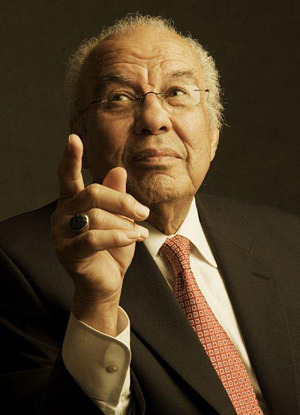 He has received 40 honorary degrees from other universities, and at least 20 major awards in recognition of his leadership in higher education as well as his unselfish service to New Orleans and to the nation. Among Francis’ civic endeavors, he serves (or has served) as chair of the Louisiana Recovery Authority, immediate past chair of the Louisiana Disaster Recovery Foundation, immediate past Chair of the Southern Education Foundation, chairman of the board of Liberty Bank and Trust and a member of the Times-Picayune Advisory Board. In the past he has been chairman of the New Orleans Aviation Board, the Metropolitan Area Committee Education Fund and the board of directors of PBS-affiliate WLAE-TV. On the national level, Francis’ activities include serving as past chairman of the boards of the Educational Testing Service, the Carnegie Foundation for the Advancement of Teaching, The College Board, the Southern Education Foundation and the American Association of Higher Education. In the past he was member president of the UNCF, a member of the Board of Trustees of Catholic University, and chairman of SACS, the southern regional accrediting agency for more than 11,000 institutions in 11 states.